Game Update 1.6 is due to launch later this week, full patch notes below. Alliances can now create Non-Aggression Pacts with each other, after doing so their bases, territory and dropships will now appear in a yellow color to indicate the pact. A new structure, the ‘Bunker’ has now been added to the game.This structure allows you to hide troops from enemy attacks. The Bunker can be built upon reaching Headquarters level 5. Medical Bay now shows a timer in the city view when troops are being healed. When viewing a report of enemy locations, the enemy units displayed can now be tapped to show more information; such as damage, defense and health. Updated the frequency recommended missions appear, as well as improving context by having them display if they can be sped up or completed for free. Rallies can now be instantly deployed at level 8 Situation Room, down from level 22. High-level Situation Rooms will now increase the Rally speed. Alliance Veterans can now also create Rallies. Scan range has been increased by 5 sectors for every level of Satellite Uplink. Battle Reports will now detail the type of the attack in the Victory or Defeat header. Deployments on the map will now have indicators which show if they belong to you or an Alliance member. Player profiles are now standardised across the game. Hostile Containment now correctly opens an extended info panel. Tax Rates are now consistent throughout the game. The VIP panel “add time” button now correctly indicates if you will activate VIP (where it’s currently inactive) or if you will add more time (where it is already active). The structure icons on the Headquarters upgrade screen no longer overlap. Fixed an issue where the alliance assist panel was appearing incorrectly on the region overview. Fixed a bug where the events window would not bring up the player or alliance information window. Fixed a bug where the event's leaderboard history would miss out some positions on the full list. Fixed a bug where you would get a message saying your facility has teleported when your outpost was destroyed. Fixed a bug where events would be able to be collected after relocating when they are not available. Fixed an issue where spinners on the rally icon on the world map and the rally creation panel had stopped spinning. Fixed a bug where units could incorrectly end up in the Medical Bay. Fixed a bug where healing units would incorrectly contribute towards power gain event. Fixed a bug where speeding up healing units to completion from the medical bay window would not refresh the window contents. Fixed a bug where completing the research from the speed up panel would mean the research tutorial broke. Fixed an issue where your dropship counter on the hud would be off in some situations. Fixed an issue where the world zoom did not reset when switching to the world. Fixed an issue where your hero would not go to the Medical Bay on the client if he died and there were no other units present. Fixed a bug where demolishing an outpost while being online would not result in your power dropping. Fixed a bug where the hero and headquarters level up window would not animate if another window was shown immediately after. We're looking forward to hearing your feedback on our latest update, and as always more updates are already in the works! Nice job, this sounds like a proper game update! Edited by industria, 24 April 2017 - 20:11.
so this means the top scanning(level 22) is 29 sectors? that's not much better, i probably still won't use it,unless im wrong on what you ment there. Edited by INDeeDO, 24 April 2017 - 22:53. What does it mean when it says "Tax Rates are now more consistant thought game" in the bug area. Edited by industria, 25 April 2017 - 01:34. In some panels, the game may tell you different tax rates incorrectly. Please make the naps a 2 way agreement,this way you know the other alliance has agreed to the terms. also make them actual naps,block aggression. all you have done is a visual aid,no more,which is kinda poor. the bunker,it's ok,could be a little more. Edited by INDeeDO, 26 April 2017 - 11:28. I have to agree, pacts are currently a bit useless if they dont require the other side to agree, furthermore we would like to have technical restriction for attacks and not only a notifications. p.s. notifications could stay, but it must be done for both sides! Edited by industria, 26 April 2017 - 20:04. BUG:mobile advertisements are broken,shard reward advertisement does not happen,daily reward does not double(watched 10 small advertisements,no change). 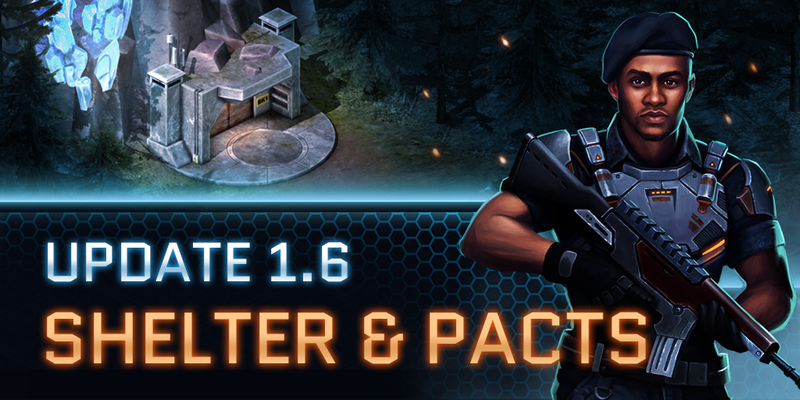 Update 1.6.2 should now be available on all platforms. Any issues with video ads should be solved. Generally a great patch, but I'm not sure I'm interpreting the scan buff correctly. Wouldn't that mean with a lv 10 Satellite Uplink my scanning range would be 50 (+2 base or something)? That seems too strong, but simply buffing it by 5 base is still way too weak, and even further diminishes the effect the uplink level has. It's kind of annoying now to always having to zoom out everytime I switch view.